Cleavers (Galium aparine), with its characteristic ‘sticky’ seeds, is easily introduced to gardens from uncultivated land and can become a sprawling nuisance in beds and borders. Cleavers is a common annual weed native to hedgerows, scrub and arable land, which can spread to gardens on the fur of animals and clothing of passers-by. Although seedlings usually appear singly, rather than en masse like many other common weeds, the numerous and easily distributed seeds mean the weed can quickly establish in gardens if not controlled promptly. Weak, sprawling stems, up to 1m (39in) long bear whorls of 6-8 long, slender green leaves with a prominent central vein. Tiny greenish-white flowers are borne in branching clusters from May to August and develop into round, green or purple fruits 3-5mm in diameter. Stems, leaves and seed have stiff hooked hairs. The small, hairy seeds of this weed are produced in large quantities, of between 300-400 seeds per plant, are easily distributed and can persist in the soil for 6 years. Although individual plants are easy to remove, the weed can establish quickly if allowed to mature and set seed. Hand-pulling or hoeing of weed seedlings is the easiest way to control this weed, but is time consuming and needs doing promptly - before plants flower and set seed - to be effective. Use gloves if grasping stems directly. As seeds can lie dormant in the soil for long periods of time, this task will be on-going. To help reduce the number of seeds introduced to the garden, brush down clothing and pet fur following walks on arable or uncultivated land where the weed is most commonly found. It is also important to avoid adding any mature weeds, which have set seed, to a home compost bin. 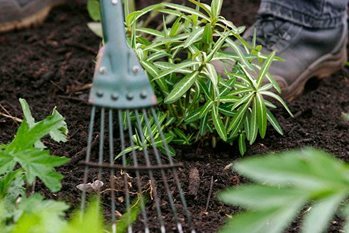 To prevent germination of weed seedlings, apply an opaque mulching film or layer of bulky organic mulch, such as woodchips, to the soil at a depth of at least 8cm (3in). Non-selective contact herbicides containing acetic acid (Weedol Fast Acting Gun! ), fatty acids (SBM Solabiol Super Fast Weedkiller) or pelargonic acid (Doff 24/7 Superfast Weedkiller) can be used in such situations to scorch off foliage. Take care if applying such herbicides between ornamental plants by covering them with plastic sheeting whilst spraying. The covers can be removed once the spray has dried onto the weed foliage. The systemic non-selective herbicide glyphosate can be used in the same way, but it is particularly important to avoid spray or spray drift coming into contact with garden plants. If treating weeds in the immediate vicinity of garden plants, apply carefully using a ready-to-use spray in cool, calm weather. Protect branches and shoots by tying them aside, or by using covers or screens. Make sure weed foliage has dried before releasing branches or removing coverings. SBM Job done Tough Weedkiller (ready-to-use only), SBM Job done Path Weedkiller (ready-to-use only) and Scotts Weedol Pathclear products containing glyphosate/diflufenican and can be applied once a season to natural surfaces where no plants are to be grown, and can also be applied under and around established woody trees and shrubs. This product kills off existing small green growth and prevents or checks developing growth. Check manufacturer’s recommendations before use to avoid damaging sensitive plants. Weedkillers for gardeners (Adobe Acrobat pdf document outlining weedkillers available to gardeners; see sections 3 and 5).